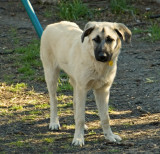 We are fostering Bonnie for the National Anatolian Shepherd Rescue Network (www.nasrn.com). She is ten weeks old and is a Pyrenees mix, possibly part Anatolian. She definitely has the Anatolian look since she is cream with a black mask. Bonnie is part of a litter that was turned over to a shelter by the owners. There are five other pups in the litter. All of them need homes, and several could use long-term foster homes. If you think you are interested in fostering or adopting one of the puppies you can contact the rescue through their web page above. Bonnie has been with us just a little over a day but has proven to be very social with people and other dogs. She is a lovable pup who enjoys playing outside and is still a power-napper as most youngsters are. Bonnie continues to have a good appetite and we will get a weight on her when she goes in for booster shots next week. With good food her coat texture and thickness seem to be improving and her weight is going up. She responds to her name and, although she is by by no means house broken yet, she does prefer to wait until she is let out to take care of business. We are crate training her and although she does not like it I think she is getting more used to it. Her leash manners are also improving. Bonnie went with us for a Thanksgiving trip and rode fairly well in the car about three hours each way. She was very happy to meet a lot of strangers and impressed everyone with her manners. Bonnie went to the vet for booster shots. She weighs 27 pounds at ~13-14 weeks. I expect she will be over 80 pounds when she is grown, how much over that I can't say. She is now on heartworm preventative. Nothing fazed her at the vet, not even the very large needle used to microchip her. She greets every experience with a high wagging tail. This girl keeps an eager and happy attitude at almost all times. The other times she sleeps! Yes, she is actually relaxed enough that she tried to sneak in a nap at the vet. She does have a bossy personality -- you can hear her barking away at the bigger dogs sometimes when they have a toy or treat they will not share with her. Sometimes she ends up with the toy. Bonnie is a fearless little dog and I think she will be a big, confident girl that with the proper direction will be a joy to have around. Bonnie had her last shots in January and is now fully vetted, although she still needs to be spayed which we will likely schedule before too long. She is growing like a weed so I took some more pictures just to show what she looks like now. When she was at the vet in January she was just under 40 pounds so I am sure she is well over that now, but by how much I do not know. Bonnie was spayed a little over two weeks ago and weighed just over 66 pounds. She continues to grow, albeit not as fast. She is very loving with our family and still enjoys playing with our other dogs. However, as she matures she is starting to show some breed characteristics such as not being as accepting of strangers. Although she was good with the staff at the vet, she will require some time in a new home to adjust to a new family. I have added a picture of her from today, but it is not the best. Still, it should show how she is growing. She is now the second tallest dog here although she is the youngest. 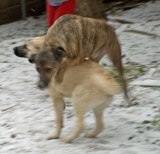 Oopps -- correction, she is second tallest of the dogs except for our other foster Abby. She is probably still a bit shorter than Abby. Update -- we adopted Bonnie in 2011 and she is now officially our dog. 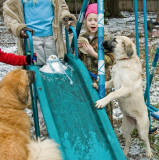 On 9-21-08, we lost our Anatolian Shepherd. She was just under 2 years old, and went into cardiac arrest while the vet was beginning surgery on her leg. We realize the diffuculty of the breed, but feel God sent this baby to us, as we were able to understand & love her. I have researced the "petfinder" website. and have some doubt of it's integrity, but your information seems sincere. Please let me know the phone or address of local contacts for the breed. I thank you for any response.